Contemporary Controls' Ethernet switch communicates environmental control and energy information as an integral part of the technology enabling the Robert Redford building in Santa Monica, CA to receive Leadership in Energy and Environmental Design (LEED) Platinum rating, the highest rating from the U.S. Green Building Council (USGBC) for green construction. This green structure uses recyclable materials, natural light, and saves water through capturing rain and recycling sink and shower water to irrigate landscaping and flush toilets. 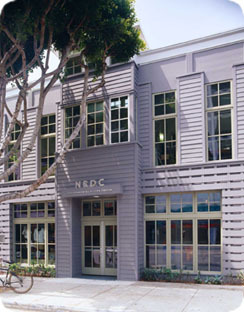 The building, named for Robert Redford, an actor and well-known environmentalist, is the new office for the Natural Resources Defense Council (NRDC). The Robert Redford Building, which opened in November 2003, is a showcase for energy technology application and is one of the first structures in the United States to receive a LEED Platinum rating. Contemporary Controls' Ethernet switches, marketed under the CTRLink® trade name, were selected by ASW Engineering Management Consultants in Tustin, CA, whose firm was engaged by Southern California Edison (SCE) who managed the project. ASW's Senior Project Engineer, Dennis Rowan, said that Contemporary Controls' (Downers Grove, IL) miniature, five-port EISM5-100T switching hub has performed without failure with data transfer speeds as expected. He said that this device's wide-range, low-voltage power requirements and redundant power features made it the ideal choice for this application. The unit was selected to address the small panel space available to maintain a minimum footprint for all the equipment. "The tiny switch (measuring only 3 x 3 inches) accommodated our space limitations and enhanced our compact panel design," said Rowan. 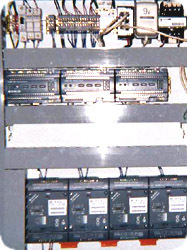 "It was easy to install with DIN-rail mount. No Velcro®, duct tape, or custom shelves." The Contemporary Controls' miniature Ethernet switch bridges three Echelon i.LON® 100 Internet Servers to the Internet outside the NRDC firewall. The Internet Gateway is the enabling mechanism for the Green Building Exhibit which educates the public on the building's energy efficiency. "The NRDC desired a fun and playful learning tool which would teach visitors how a building consumes energy," SCE's Project Manager, Christine Magar, said. "The Green Building Exhibit is a kiosk representing a unique use of real-time building systems." The kiosk is equipped with a monitor built inside a much larger wall exhibit with photos and text defining the concept of a "green" building. Four panels on the monitor display lighting expenditure, water efficiency, heating and cooling usage. The Internet Gateway provides real-time data collected at the facility to the Internet for remote examination and retrieval. "Twenty-two sensors located throughout the building gather this data (gas and water usage for example) which is available through FTP," said Rowan. "Multiple calculations are completed with the collected data from the sensors. The sensor leads terminate in the server control panel in the basement's electrical room." With the aid of Ethernet switching technology and the Internet, the Green Building Exhibit as is the Robert Redford Building enables us to become more aware of our global environment. Contemporary Controls promises to continue its support with the green movement by adhering to the European guidelines of restricting the use of hazardous materials in electrical and electronic equipment (RoHS).